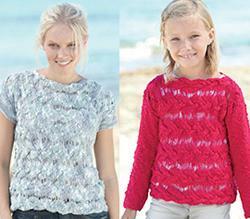 Top or sweater has body worked sideways with cables and plain long or short sleeves, shown in Sirdar Beachcomber DK. To fit women and girls 61-117 cm (24-46in). 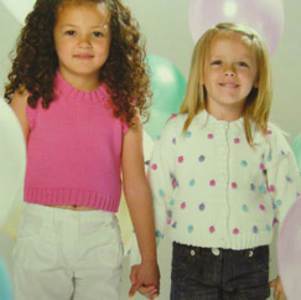 Sirdar 7123. 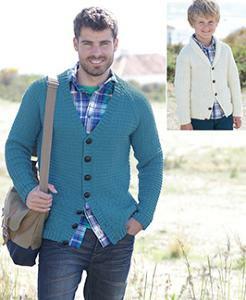 Men's DK shawl collar and v neck cardigans with unusual textured cable panels and fishermans rib yoke and sleeve. 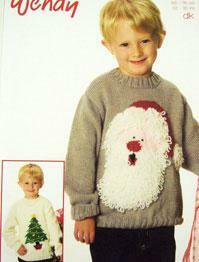 Shown in Sirdar Country Style DK. 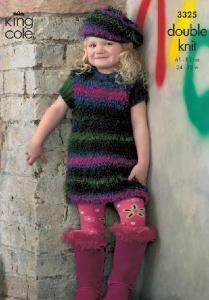 Fits adults and children 61-117cm (24-46in). 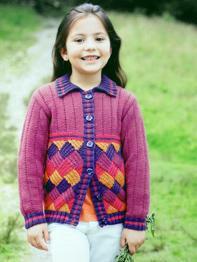 Cardigan and sweater with lace border and collar and allover eyelet patterning. 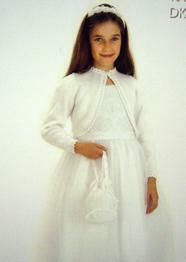 To fit sizes 51-76cm (20-30ins). 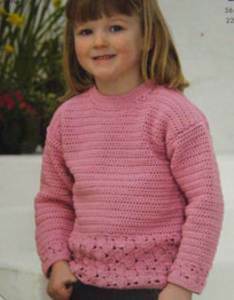 DK yarn, 24sts/32rows to 10cm over pattern on 4mm needles. 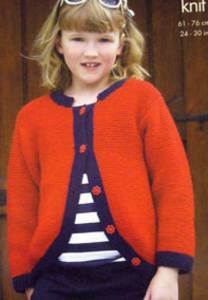 Perfectly styled cardigan with moss st sailor collar shown in luxurious Sublime Cashmere Merino Silk DK. 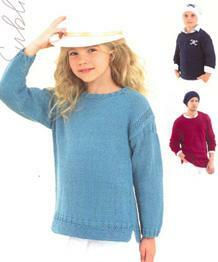 To fit age 2-11yrs, 56-76cm (22-30in). 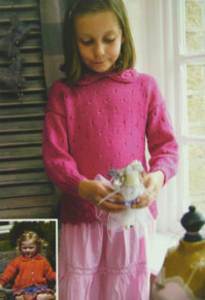 Sleeveless cable top knitted sideways with polo neck or round neckline, shown in luxurious Sublime Cashmere Merino Silk DK. 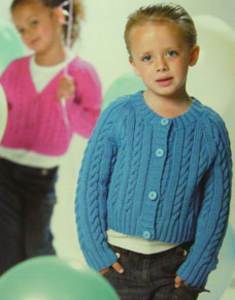 To fit age 4-11yrs, 61-76cm (24-30in). 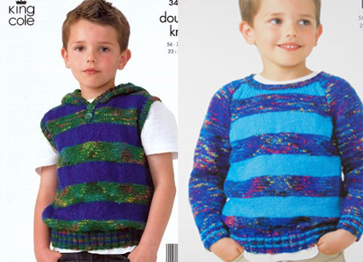 2 sweaters and a slipover in DK with simple textured design. To fit 41-66 cm (16-26 ins). 22sts/30rows to 10cm on 4mm needles. 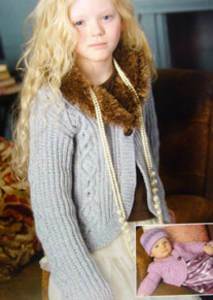 Cardigan with optional fur collar and cable panels in DK yarn. To fit sizes 41-66cm (16-26ins). 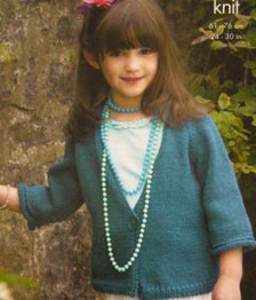 Easy cardigan flares slightly below bodice, with shawl collar or round neck. 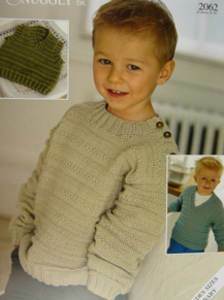 Shown in Sirdar Crofter DK, to fit 2-13yrs, 56-81cm (22-32in). 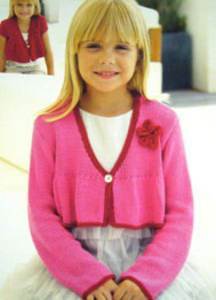 Girl's V neck cardigan flares from yoke, with long or cap sleeves, knitted flower and optional contrast trim. 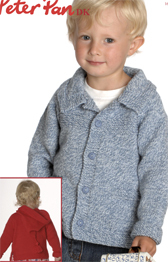 Fits 2-13yrs, 56-81cm (22-32in). 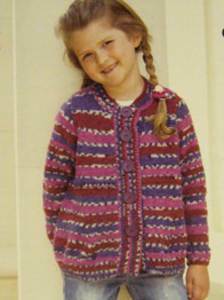 Sweater dress with polo neck and circular yoke with cable pattern from Sirdar, perfect for fashion-conscious 2-13yr olds. Fits 56-81cm (22-32in). 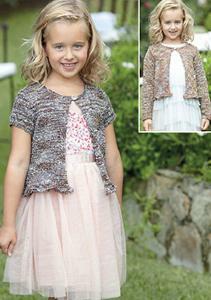 Easy knit cardigan gathered into scoop neck with tie fits girls and women 61-117cm (24-46in). 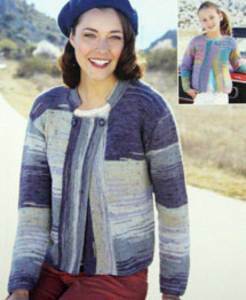 Easy cropped drape cardigan with cap sleeves shown in Sirdar Summer Stripes self patterning cotton blend DK. Fits women and girls 61-117cm (24- 46in). 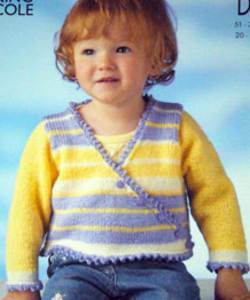 Tie front top with 3/4 or short sleeves in easy 2 row repeat mesh lace st, shown in Sirdar Summer Stripes self patterning cotton blend DK. Fits women and girls 61-117cm (24- 46in). 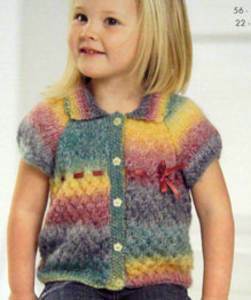 Classic scoop neck cardigan with deep ribbed waist and long or short sleeves is an easy knit, shown in Sirdar Summer Stripes DK. To fit women and girls 61-117cm (21-46in). 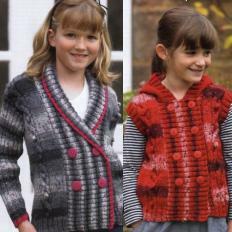 Wrapover cardigan and round neck sweater from King Cole both have eyelet flower motif and scallop edging. To fit sizes 56-71cm (22-28in). 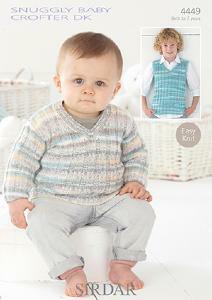 Sweater in half treble crochet with shell border and short sleeve cardigan to fit sizes 56-71cm (22-28in). 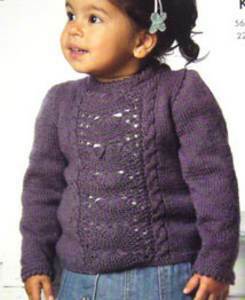 Sweater with unusual lace and cable panel and V neck cardigan with cable detail. To fit sizes 56-71cm (22-28in). Tension 22sts/30 rows to 10cm on 4mm needles. 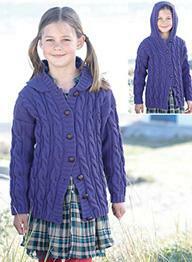 Cardigan with long or short sleeves has cable yoke and eyelet neck fastening. To fit 61-76cm (24-30in). 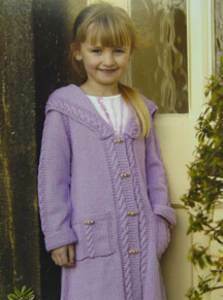 Cardigan as shown and tunic with frilled collar, 3/4 sleeves and double frill hem. To fit 61-76cm (24-30in). 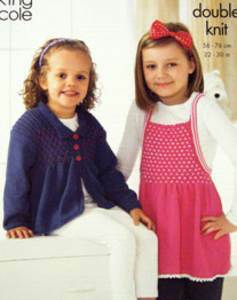 Top with short sleeves and collar plus round neck tunic with flared sleeves with eyelet st pattern on body, shown in King Cole Mirage colourphase DK. To fit 56-81 cm (22-32 in). 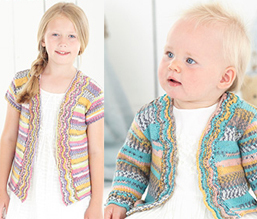 Easy garter st cardigan, plus crossover cardigan and waistcoat, all with woven ribbon trim, shown in King Cole Splash self-patterning DK. To fit 56-76cm (22-30in). 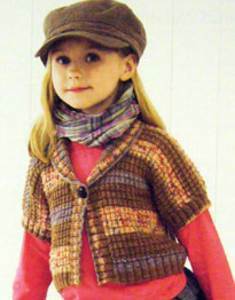 Round neck jacket flares from cable yoke, plus cabled sweater, hat and scarf. 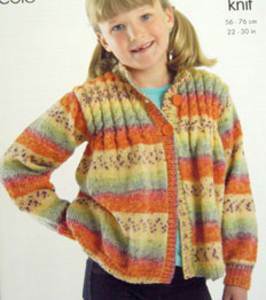 Jacket shown in King Cole Splash self-patterning DK. To fit 56-76cm (22-30in). 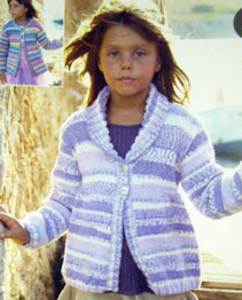 Cardigan with chunky buttons flares slightly from bodice and has eyelet detail, plus cropped cardigan, shown in King Cole Merino Print DK. To fit n51-76cm (20-30in). 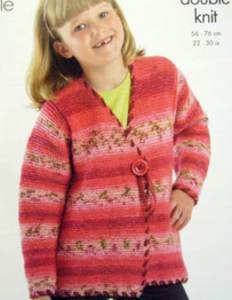 Stylish garter st cardigans with cutaway front - either trimmed with contrast decorative edging or with garter st bands - shown in King Cole Merino Blend DK. 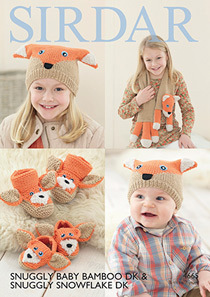 To fit 3-11yrs, 61-76cm (24-30in). 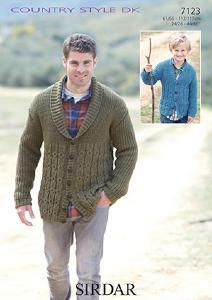 V neck raglan single button cardigan with 3/4s - one with 3/4 sleeves slightly flared from waist, the other long with deep ribbing and pockets, shown in King Cole Merino Blend DK. 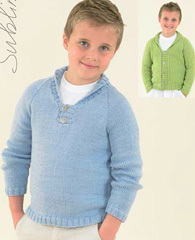 To fit age 3-11yrs, 61-76cm (24-30in). 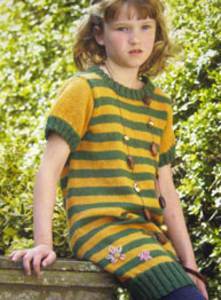 Striped short sleeve dress plus roll neck sweater with pocket and contrast trim, shown in King Cole Merino Blend Dk. 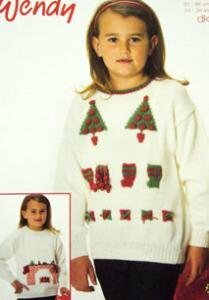 To fit 3-11yrs, 61-76cm (24-30in). 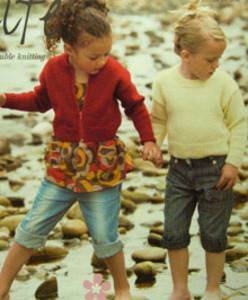 Cropped, short sleeve cardigans, one with collar in allover textured st, the other V neck with textured yoke and sleeves, plus legwarmers. 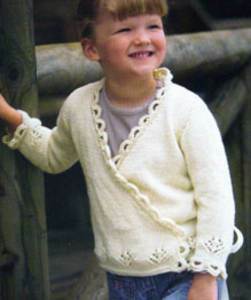 Shown in self-patterning King Cole Splash DK, to fit 1-10yrs, 51-76cm (20-30in). 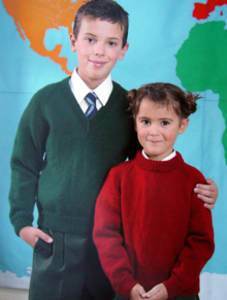 Classic V-neck and round neck sweaters with raglan sleeves - ideal school wear. 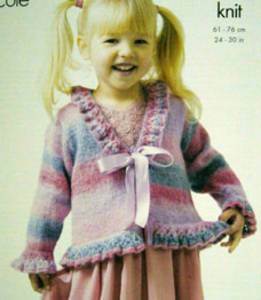 Fits 56-86 cm (22-34 in). 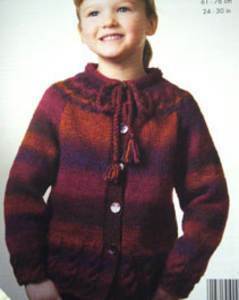 22st/30 rows to 10 cm, 4mm needles.